A required 4 hours of refrigeration means you’ll need to start long before you want to eat them, but these virtually effortless, impossibly creamy finales are worth the wait. Freeze any leftover bars in a single layer, wrapped in plastic wrap, then in aluminum foil, for up to 3 months. In a small saucepan, combine the strawberries and 1⁄2 cup of the sugar and bring to a boil. Lower the heat and simmer until the liquid is thick and syrupy, about 8 minutes. Remove from the heat, stir in the vinegar, cool, and reserve in the refrigerator. In a small bowl, add the graham cracker crumbs, remaining 2 tablespoons sugar, and the butter and mix to combine. Press the graham cracker base into a thin, even layer on the bottom of an 8-inch square pan. Chill for 10 minutes in the freezer. With a stand mixer fitted with a whisk attachment or by hand, whisk together the cream cheese, mascarpone, and lemon juice until blended, scraping down the sides of the bowl as needed. Add the whipping cream and whip until stiff. Whip in the maple syrup and vanilla. In a small bowl, combine the gelatin and the boiling water, stir until completely dissolved, then add to the cheesecake mixture. Smooth the cheesecake mixture over the graham cracker base. Cover the pan with plastic wrap and refrigerate for at least 4 hours. 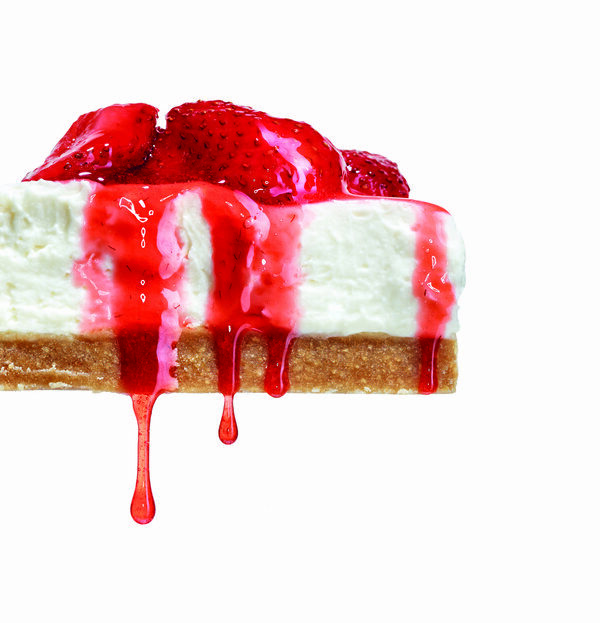 Cut the cheesecake into 8 bars, dipping the knife into hot water and wiping it clean after each cut. Garnish with the strawberry compote and serve.